Just as I love reading cookbooks I also love going into grocery stores frozen sections and looking at their prepackaged meals for ideas. 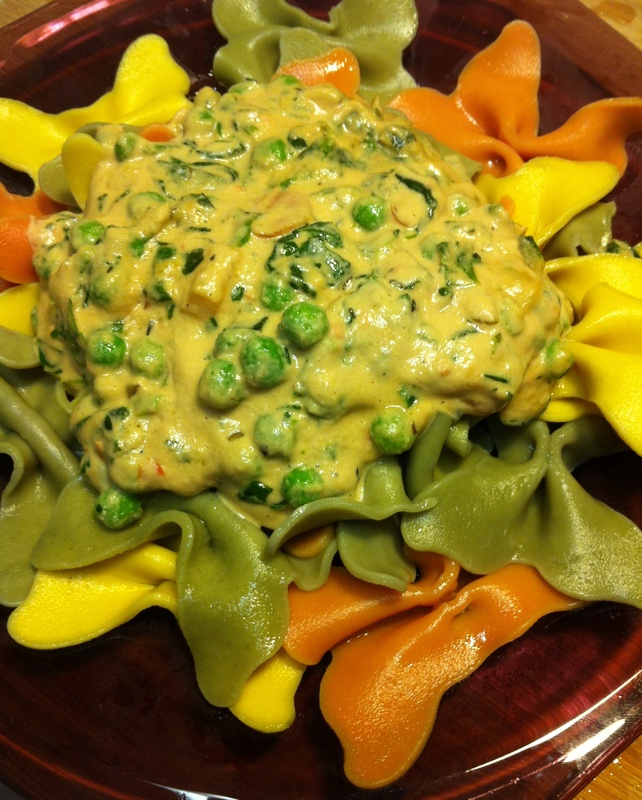 I recently found a package of Polenta Provencale with Peas and Spinach in a Spicy Cream Sauce. I took a picture of the ingredients which included creme fraiche and cheese and set out to make my own. Not sure what it should have tasted like but it turned out delicious. This is not a low-fat meal by any means but if you have friends that think they couldn’t live without dairy this dish might change their mind! I had made extra so I would have left overs for lunch but Hubby wasn’t going to let that happen. He has been craving Alfredo sauce for a long time and this definitely filled that void. I had this butterfly pasta for a while that the Little Vegan had really wanted to use so I opted for that instead of the polenta. *The little vegan liked the blended raw portion of the sauce and ate it over her pasta. *If you don’t want the spice leave out the cayenne. *As is the spice was very mellow, adding flavor rather than bite. If you want more of a bite add more but I would recommend doing it a little at a time. *I would recommend sticking with garlic powder rather than fresh garlic for its subtle flavor. Put ingredients from cashew cream to Braggs in blender and blend until creamy. Set aside. Start water for pasta and cook once it is ready. Add bell pepper, peas, spinach and butter to the onion mixture. Once butter has melted add flour and stir in gently as to not smash the peas. Cook for 10 minutes on medium-low. After 10 minutes reduce heat to low and add cashew cream mixture and stir gently until well blended. Once pasta is finished serve with sauce. Like this recipe? Consider backing our Kickstarter. Click here.